The Secretary of State for Justice, Michael Gove, has announced a new board member for the Youth Justice Board. The Secretary of State for Justice, Michael Gove, has appointed Dr Tony Sewell as a new member of the Youth Justice Board. His tenure, which began on 19 October, will last for one year. Dr Sewell began his career as a London school teacher. He went on to spend many years as a teacher trainer, working at Kingston and Leeds universities. 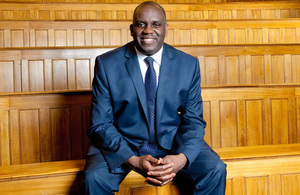 He has authored a number of reports about the experience of boys in education, and has also been an international consultant in education for, among others, the World Bank and the Commonwealth Secretariat. He works in both the UK and the Caribbean and helped to set up the Science, Maths and Information Technology Centre in the department of education at Jamaica’s University of the West Indies. Tony is also the CEO of Generating Genius, an organisation which uses science and engineering to steer black boys towards higher education. In 2012, Tony was appointed by Boris Johnson to chair the Mayor’s Education Inquiry into London schools. Its final, landmark, report, published in 2013, led to the establishment of the £24m London Schools Excellence Fund, which sees high performing schools working with partners to help raise standards of teaching in other schools. Tony has an outstanding track record in the education sector at both national and international level, and his pioneering work to raise the attainment of children and young people from disadvantaged backgrounds is exemplary. His passion for addressing educational discrimination has driven real change in the school system. I look forward to working with Tony in his role to provide challenge and support to the Board and in bringing his special experience to the issue of the over representation of black and ethnic young people in our criminal justice system. I believe that the most challenging young people in our society can be irrevocably changed by education, mentors, and a sense of purpose. I look forward to bringing my extensive experience in the education sector, particularly within diverse communities, to assist the important work of the Youth Justice Board as it continues in its vital role.